Hebrews 4:12: For the word of God is living and active. Sharper than any double-edged sword, it penetrates even to dividing soul and spirit, joints and. 2 Hebrews 4:12: For the word of God is living and active. Sharper than any double-edged sword, it penetrates even to dividing soul and spirit, joints and marrow; it judges the thoughts and attitudes of the heart. 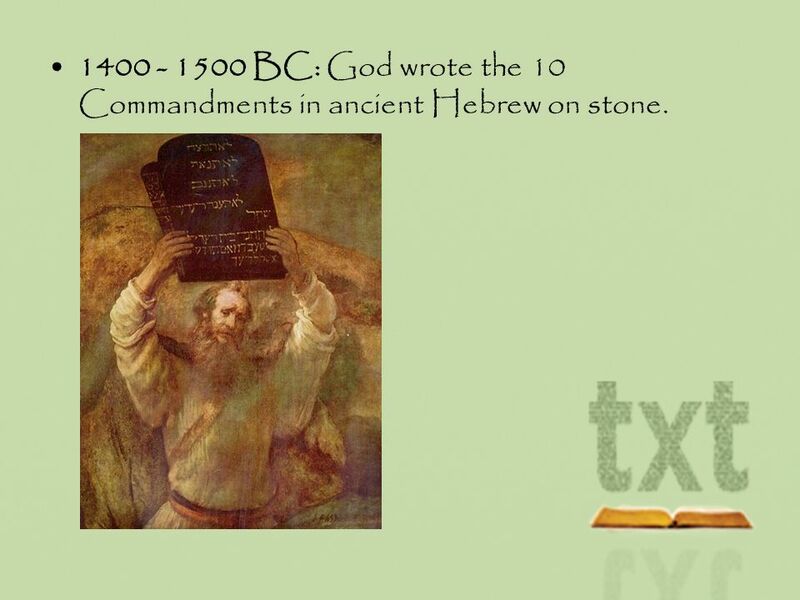 4 1400 - 1500 BC: God wrote the 10 Commandments in ancient Hebrew on stone. 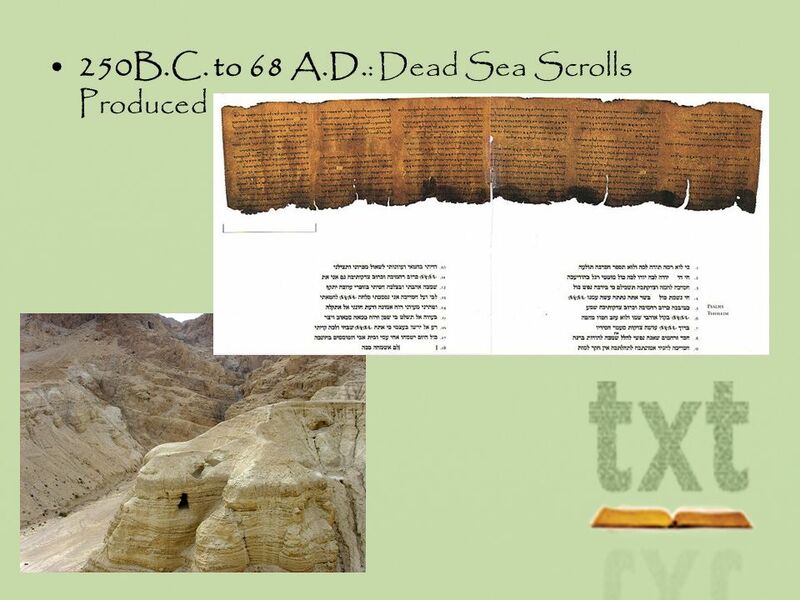 5 500 BC: 39 books that make up the Old Testament were completed and preserved in Hebrew on scrolls. 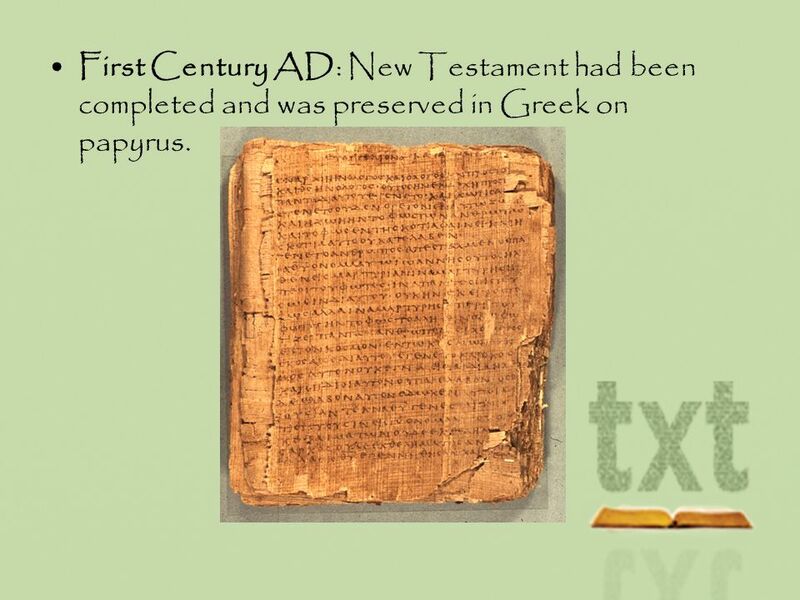 6 First Century AD: New Testament had been completed and was preserved in Greek on papyrus. 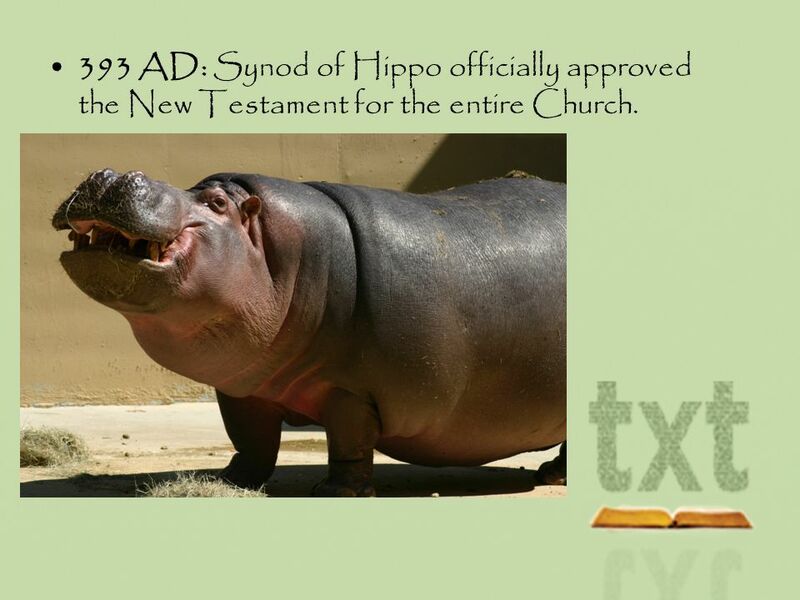 8 393 AD: Synod of Hippo officially approved the New Testament for the entire Church. 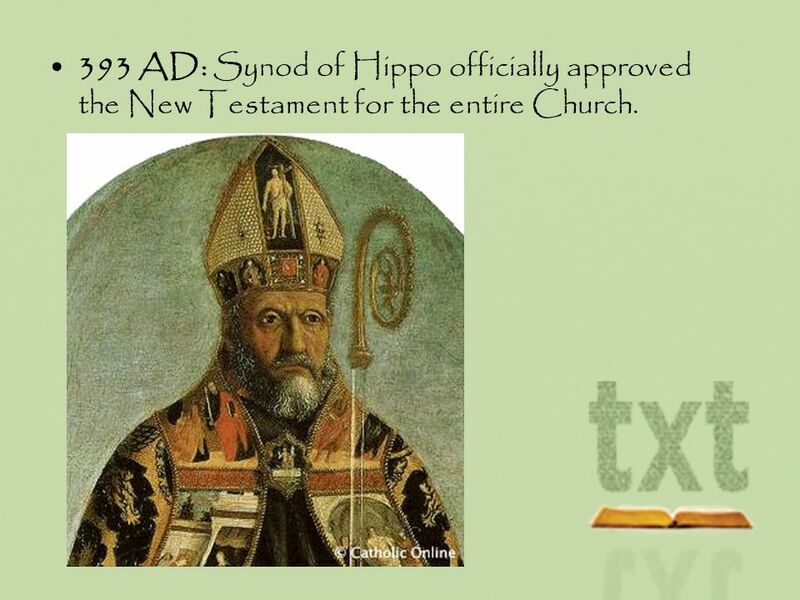 10 Canon: Standard 1.Test of Divine Inspiration: Does the book claim to be inspired? 2.Test of Human Authorship: Is the book written by a credible author? 3.Test of Genuineness: Can the book be traced historically back to the time/author who claimed to write it? 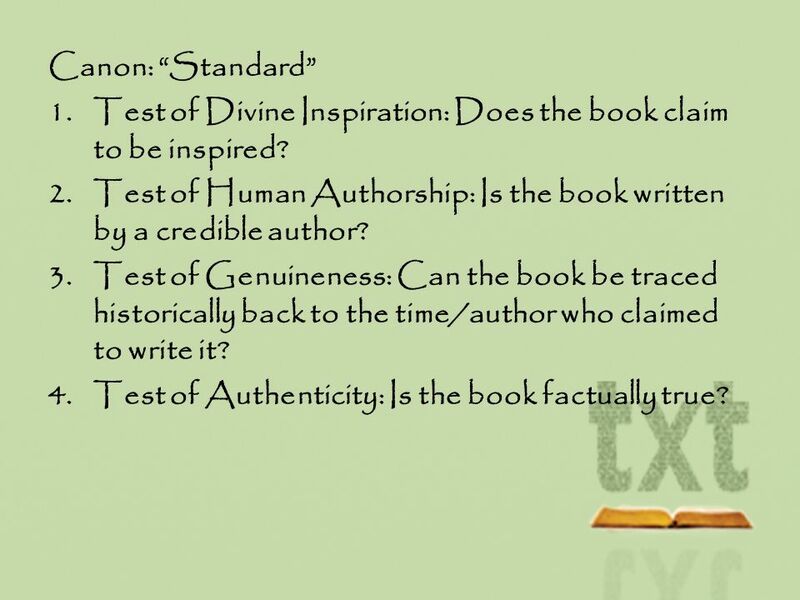 4.Test of Authenticity: Is the book factually true? 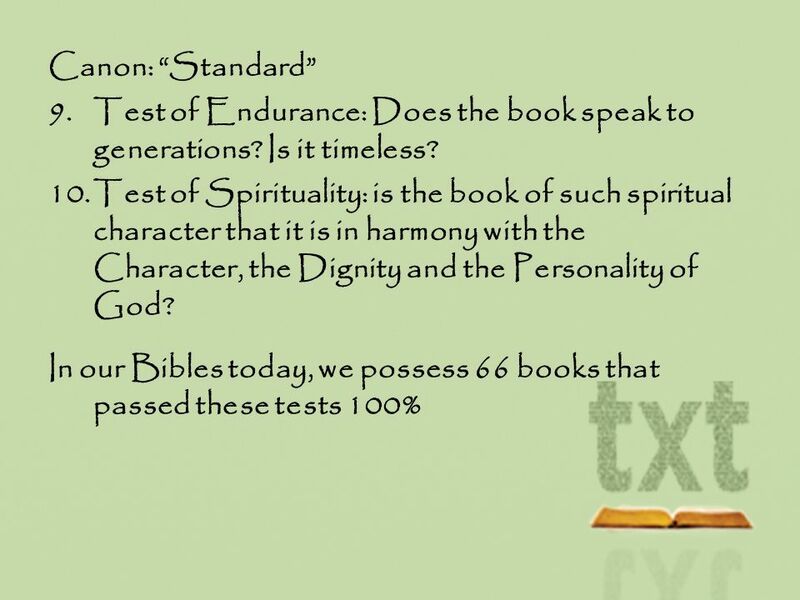 11 Canon: Standard 5.Test of Testimony: Was the book recognized by the Christians of the Day? 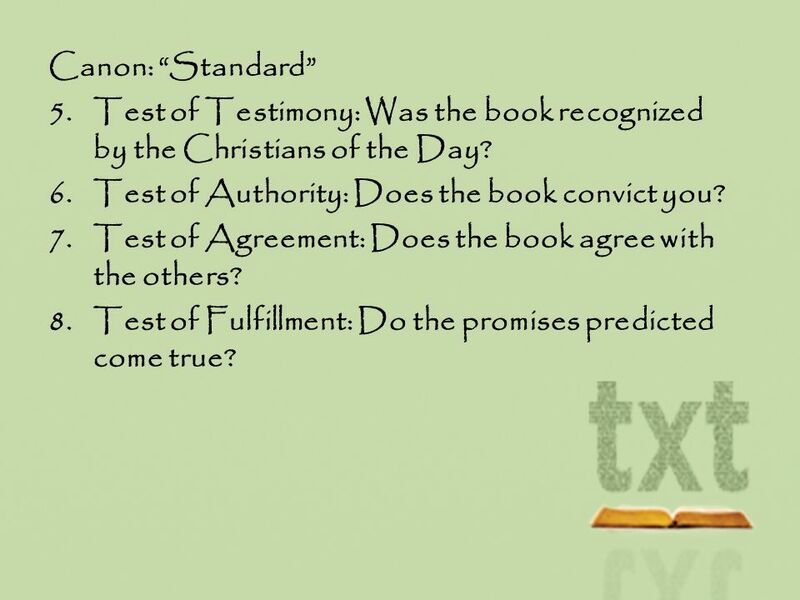 6.Test of Authority: Does the book convict you? 7.Test of Agreement: Does the book agree with the others? 8.Test of Fulfillment: Do the promises predicted come true? 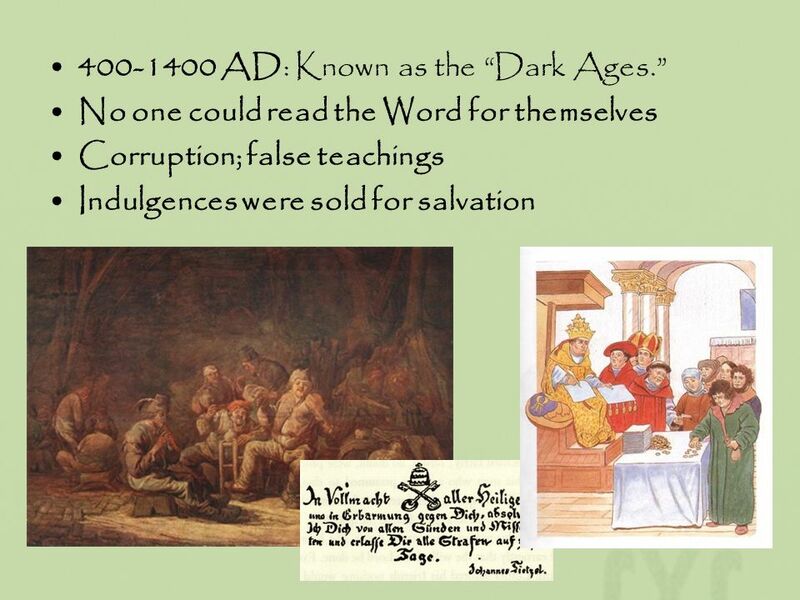 13 500 AD: Bible had been translated into over 500 languages. 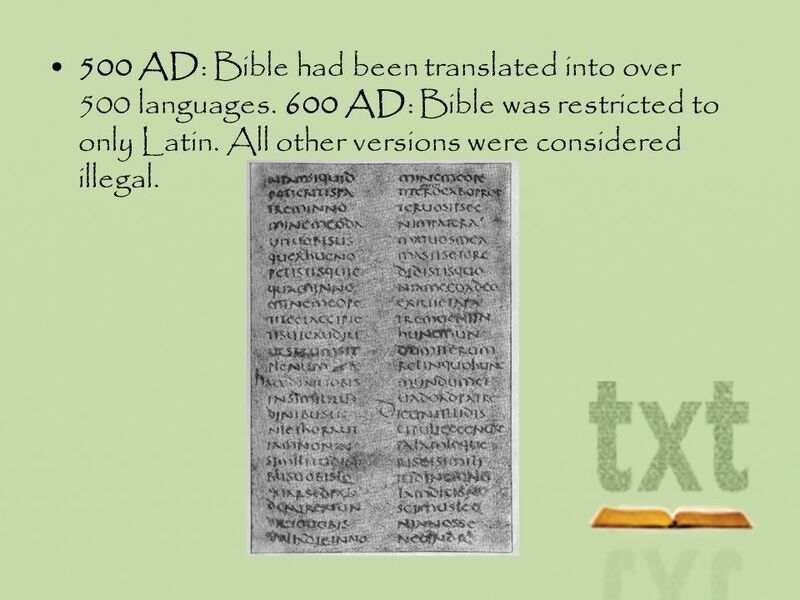 600 AD: Bible was restricted to only Latin. All other versions were considered illegal. 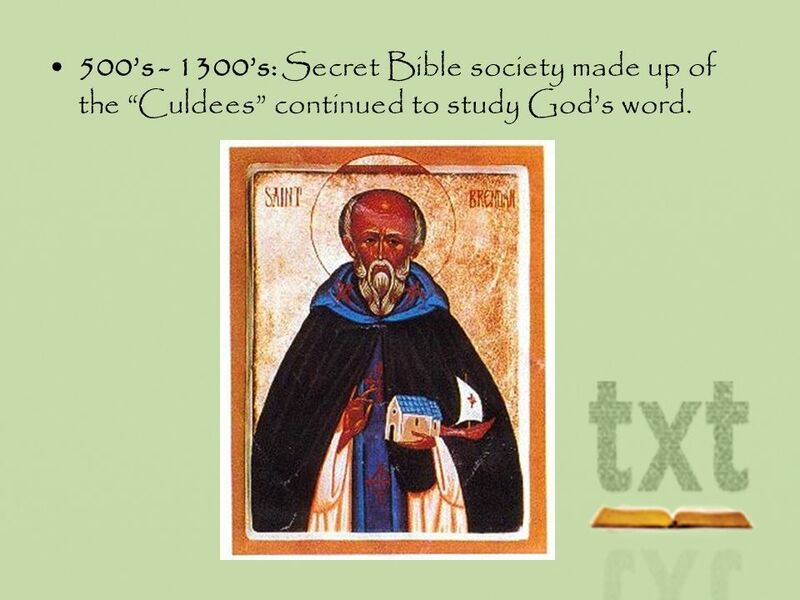 15 500s - 1300s: Secret Bible society made up of the Culdees continued to study Gods word. 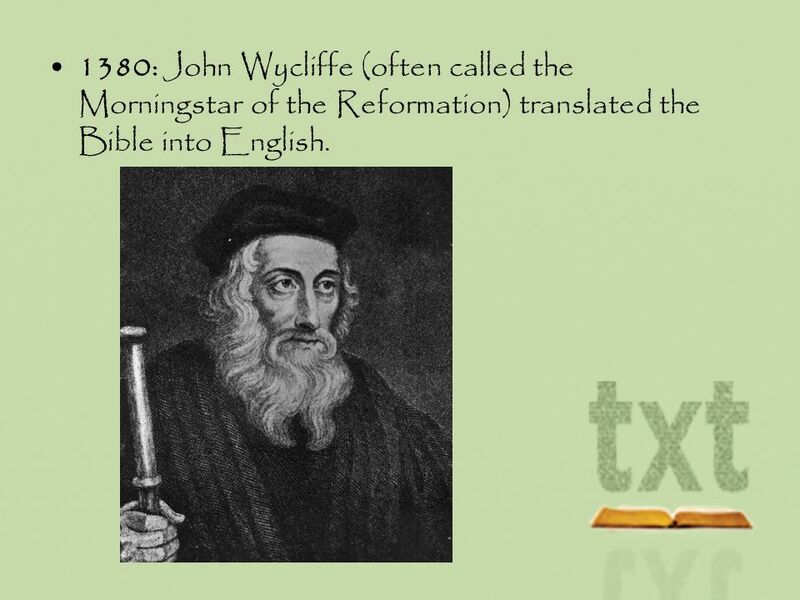 16 1380: John Wycliffe (often called the Morningstar of the Reformation) translated the Bible into English. 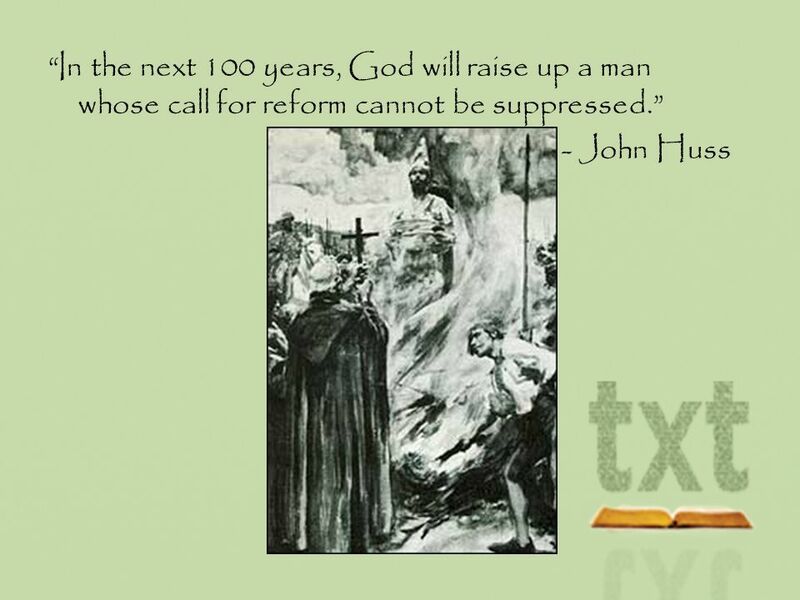 17 1415: John Hus burned at the stake for his stance for the Bible. Wycliffes bibles used to start the fire. 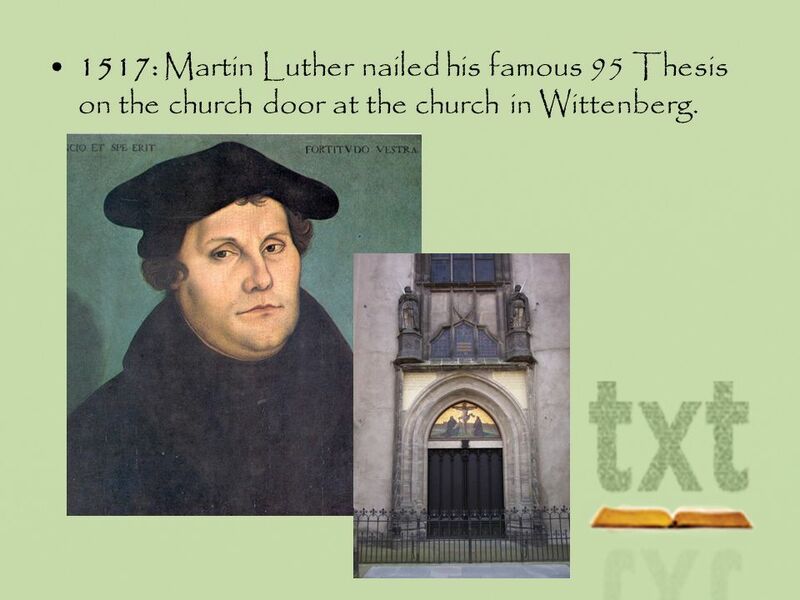 19 1517: Martin Luther nailed his famous 95 Thesis on the church door at the church in Wittenberg. 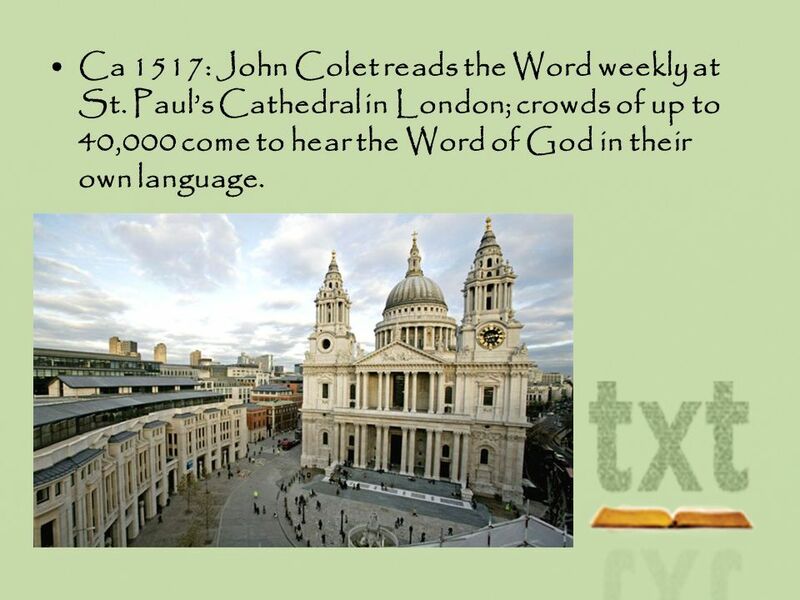 20 Ca 1517: John Colet reads the Word weekly at St. Pauls Cathedral in London; crowds of up to 40,000 come to hear the Word of God in their own language. 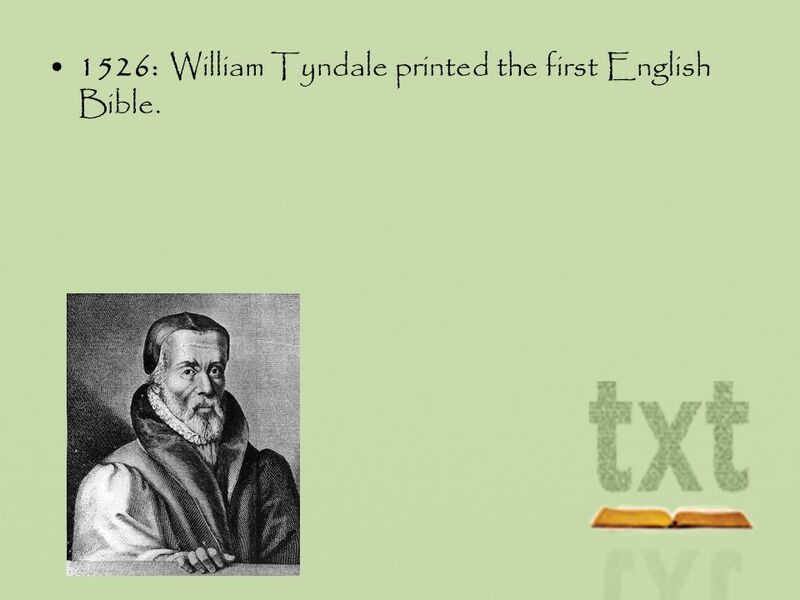 21 1526: William Tyndale printed the first English Bible. 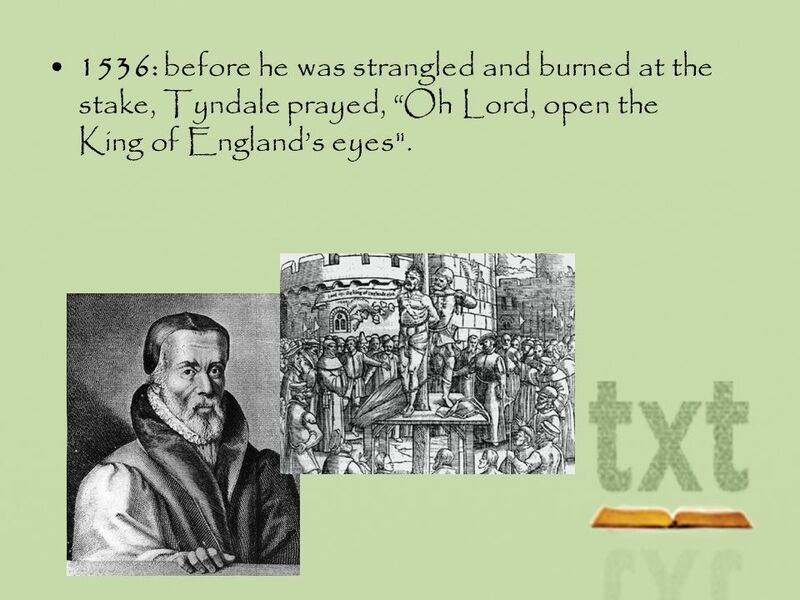 22 1536: before he was strangled and burned at the stake, Tyndale prayed, Oh Lord, open the King of Englands eyes". 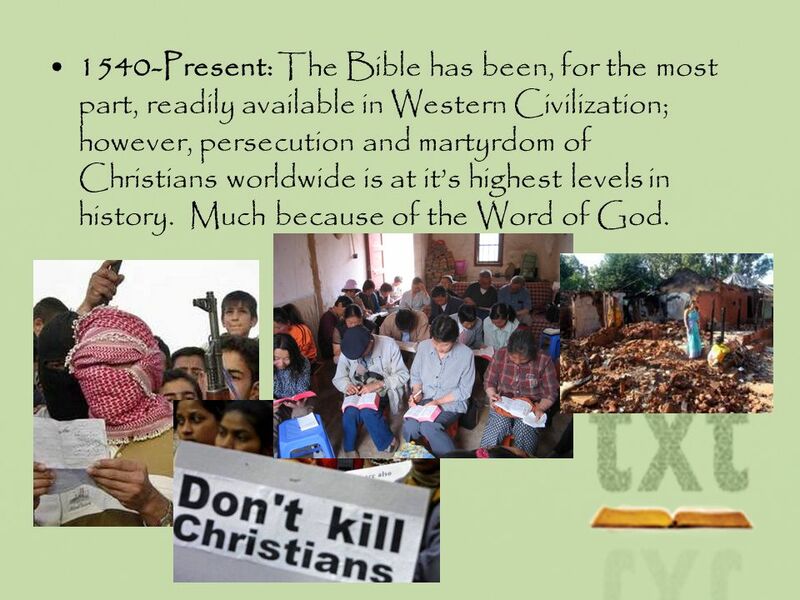 24 1540-Present: The Bible has been, for the most part, readily available in Western Civilization; however, persecution and martyrdom of Christians worldwide is at its highest levels in history. Much because of the Word of God. 25 I delight in your decrees; I will not neglect your word. 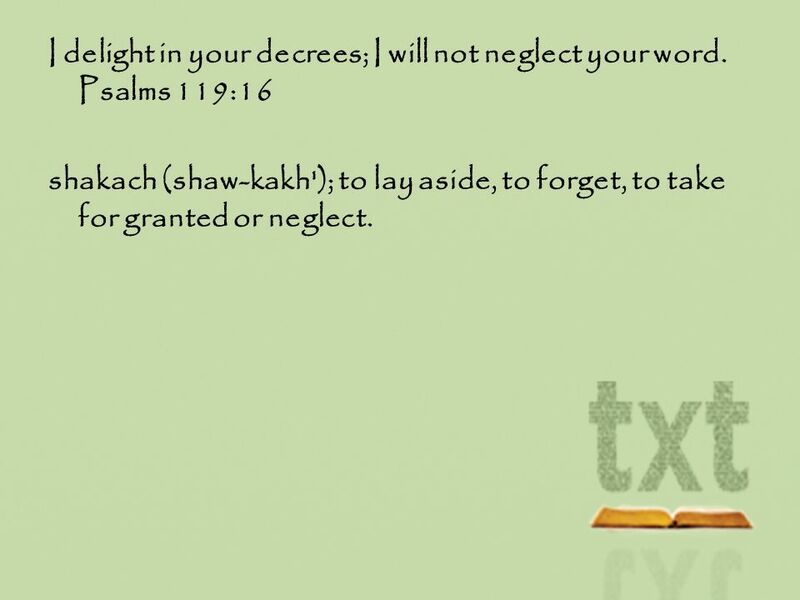 Psalms 119:16 shakach (shaw-kakh'); to lay aside, to forget, to take for granted or neglect. 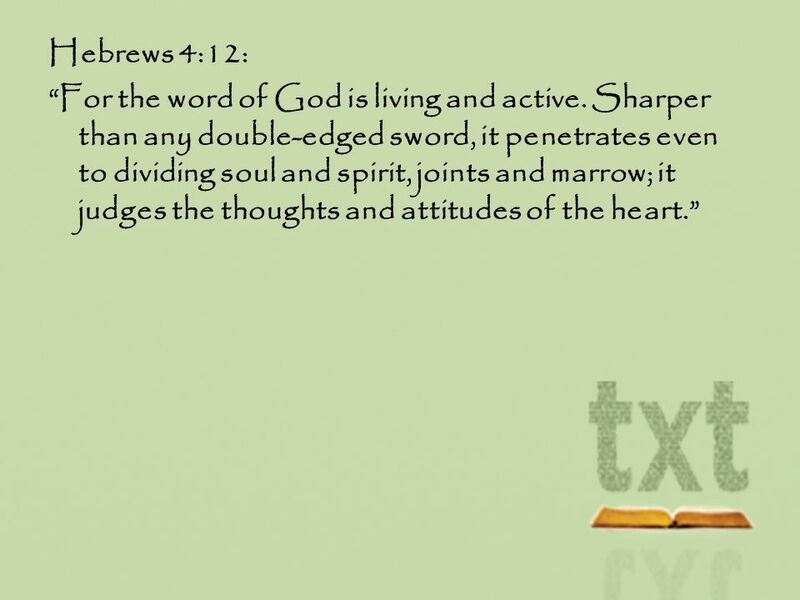 Download ppt "Hebrews 4:12: For the word of God is living and active. Sharper than any double-edged sword, it penetrates even to dividing soul and spirit, joints and." How did we get from… To here… Buckle your seat belt… Its a story that either will upset your faith or affirm your faith! 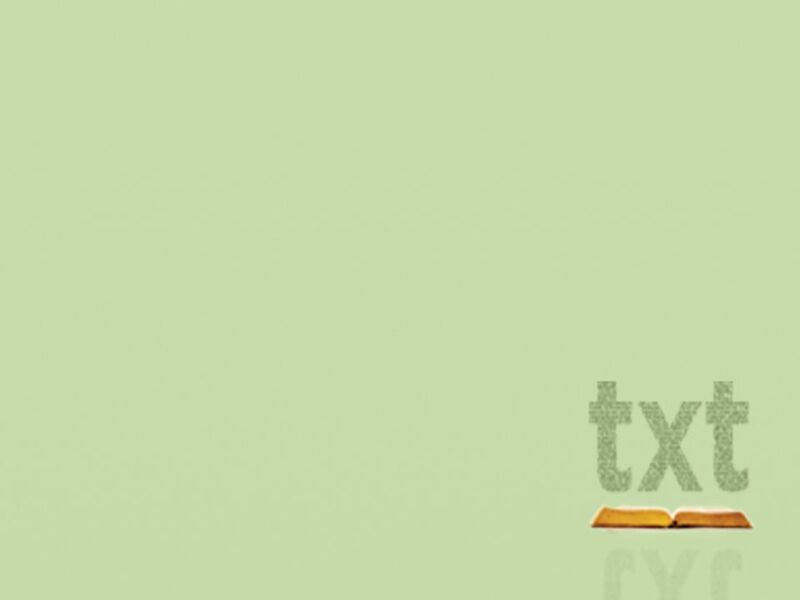 Recap of Session Three Question: Is the Bible authentic? Why? 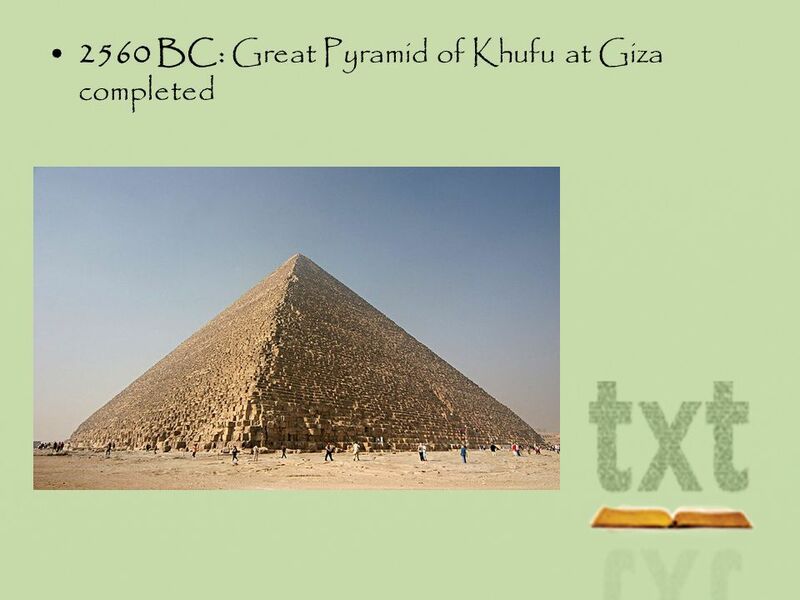 Answers: 1.Fulfilled Prophecy 2.Historical Accuracy 3.Scientific Accuracy 4.Indestructibility. 15 and that from childhood you have known the Holy Scriptures, which are able to make you wise for salvation through faith which is in Christ Jesus. 2. Chapter 1 Our Story of Faith. Vocabulary  Bible – amazing story of God’s love for us; God’s word written down by humans; the Church’s holy book, also. Discerning “Why is it Important?”. Discerning Does God really want us to understand and know His will? Why is it important that we know what His will. Review 01 “The Bible”. A - In the Holy Scriptures, the Bible. 1.Where do we find the record of God at work in the world and speaking to mankind? First Baptist Church, Kenedy Glorifying God … Reaching People … Making Disciples. For the word of God is living and active. Sharper than any double-edged sword, it penetrates even to dividing soul and spirit, joints and marrow; it judges. 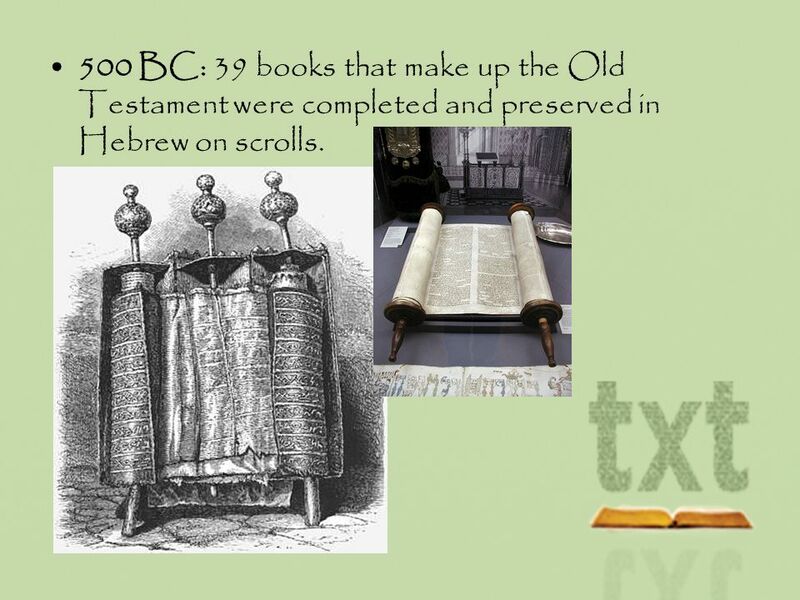 A Time Line of Key Events in the History of the Bible ow We Got the ible. The Bible A Work of Art. Bible Statistics Over 20 million Bibles are sold each year in the U.S. in addition to tens of millions that are distributed free. 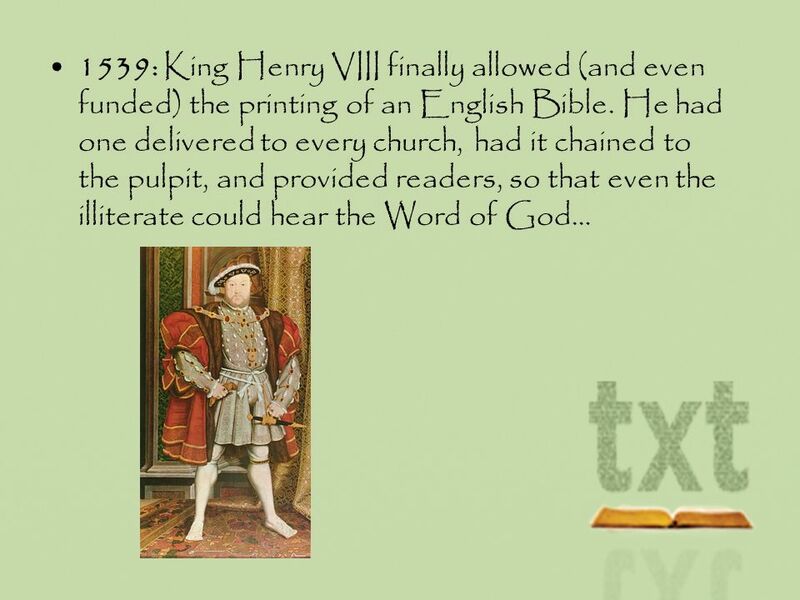 The Reformation and Christianity Christianity a follower of Jesus Christ.